Jalapeño Roots blends deep smoky jalapeño flavour with bright notes of lemony lime in a base of organic carrot, onion, peppers and garlic. 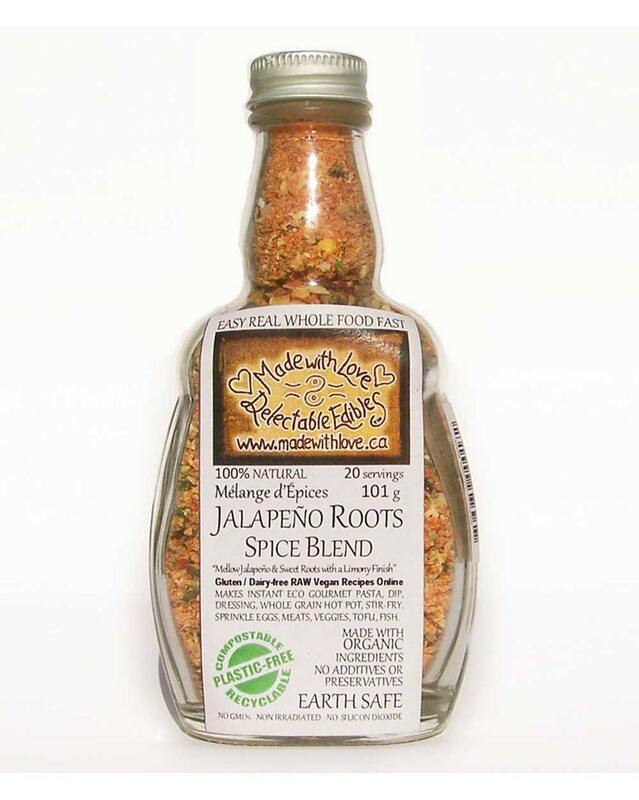 We love Jalapeno Roots Spice Blend on prawns, fish or in scrambled eggs or tofu. Gorgeous as a creamy dreamy pasta sauce. Medium heat... great as BBQ grill rub! This 100% natural, adorable 4.5 oz medi size glass bottle is hand dipped in natural small farm beeswax & comes nestled in our signature eco gift box with gorgeously green dried flowers, twigs, hearts, herbs and spices & 100% recycled fibre kraft tissue & note card. Please add your personal message in a note with your purchase. Everything at Made with Love is made from natural, non-irradiated, non-GMO, RAW and organic ingredients. We work hard to source from small organic farmers often and everything we create is made lovingly by real human hands. 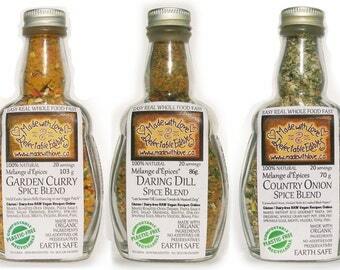 100% natural, handcrafted artisan blends of veggies, herbs and spices. Simple whole food pantry staples, traditional blends with a twist of earth trekking adventure... feed yourself and your loved ones very well, while simultaneously nourishing self with calm simplicity and ease. Each of our nine flavours are simply delicious in dips, salads, soups, veggies, chicken, meats, fish, tofu, eggs, potatoes, sauces, pastas, breads or on the barbeque. A generous sprinkle before cooking or marinating will make your whole world taste good!